This species is accepted, and its native range is Senegal, Eritrea to S. Africa, Afghanistan. Tufted or shortly rhizomatous perennial; culms slender or robust, 70–250 cm. high. Leaf laminae 15–48 × 0.5–3.5(4) cm., linear to narrowly lanceolate, cordate or amplexicaul at the base, acuminate. 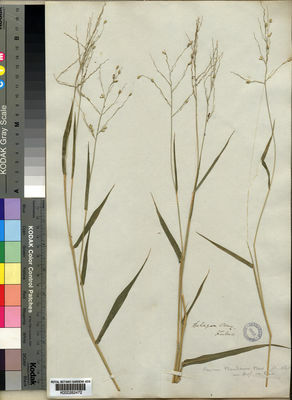 Panicle 10–40 cm. long, ovate to oblong, the primary branches stiff and usually ascending, rarely spreading, secondary branches usually very short, antrorsely scaberulous, pilose and clavellate-hairy or glabrous. Spikelets 3.5–5(5.5) mm. long, oblong, glabrous, obtuse. Inferior glume broadly ovate, 1/2–2/3the length of the spikelet, 5–7-nerved; superior glume 7-nerved, as long as the spikelet. Inferior lemma 5-nerved, male, its palea well developed. Superior lemma and palea dull or shining. Inferior lemma 5-nerved, male, its palea well developed. Superior lemma and palea dull or shining. Perennial; caespitose. Rhizomes short. Culms 70-200 cm long. Ligule a ciliate membrane. Leaf-blade base simple, or broadly rounded. Leaf-blades linear, or lanceolate; 15-48 cm long; 5-35(-40) mm wide. Leaf-blade surface glabrous, or pilose. Leaf-blade apex acuminate. Inflorescence a panicle. Peduncle glabrous, or pilose above (clavellately). Panicle open; oblong, or ovate; 10-40 cm long; with spikelets clumped along branches. Primary panicle branches ascending, or spreading. Panicle branches stiff; scaberulous; glabrous (rarely), or pilose; with clavellate hairs. Spikelets solitary. Fertile spikelets pedicelled. Spikelets comprising 1 basal sterile florets; 1 fertile florets; without rhachilla extension. Spikelets oblong; dorsally compressed; obtuse; 3.5-5(-5.5) mm long; falling entire. Rhachilla internodes elongated between glumes. Glumes similar; reaching apex of florets; thinner than fertile lemma. Lower glume ovate; 0.5-0.66 length of spikelet; herbaceous; without keels; 5-7 -veined. Lower glume apex acute. Upper glume ovate; 1 length of spikelet; herbaceous; without keels; 7 -veined. Upper glume apex acute. Basal sterile florets male; with palea. Lemma of lower sterile floret similar to upper glume; ovate; 1 length of spikelet; membranous; 5 -veined; acute. Fertile lemma oblong; dorsally compressed; 3.5-5(-5.5) mm long; indurate; pallid; dull, or shiny; without keel. Lemma margins involute. Lemma apex obtuse. Palea involute; indurate. Anthers 3; 3-3.5 mm long. Africa: west-central tropical, northeast tropical, east tropical, southern tropical, and south. Asia-temperate: western Asia. South America: Brazil. Tufted, shortly rhizomatous perennial; culms slender or robust, branched or unbranched, 70–200 cm. high, often pilose and clavellate-hairy just below the panicle. Leaf-blades linear to narrowly lanceolate, 15–48 cm. long, 5–35(–40) mm. wide, cordate or straight at the base, herbaceous, glabrous or pilose, acuminate. Panicle ovate to oblong, 10–40 cm. long, the primary branches stiff and usually ascending, rarely spreading, secondary branches usually very short, antrorsely scaberulous, pilose and clavellate-hairy, rarely glabrous. Spikelets oblong, 3.5–5(–5.5) mm. long, glabrous, pale green, often tinged purple, blunt; lower glume broadly ovate, 1/2–2/3 the length of the spikelet, herbaceous, 5–7-nerved, separated by a short internode from the rest of the spikelet; upper glume herbaceous, 7-nerved, acute; lower lemma membranous, 5-nerved, male, its palea well developed; upper lemma pale, dull or shining. Forest to deciduous bushland and grassland on clay/loam or sandy stony soils; 0–2000 m.
Panicum corymbiferum Nees ex Steud. Berhaut, Fl. Sén. ed. 2, 404, 415. D.M. Napper, Grasses of Tanganyika: 64 (1965). K.W. Harker & D.M. Napper, An Illustrated Guide to the Grasses of Uganda p. 44 (1960). A.V. Bogdan, A Revised List of Kenya Grasses p. 37 (1958). Robyns, Flore des Spermatophytes du Parc National Albert 3: 99 (1955). Eggeling, Ann. list grasses Ug. : 131 (1947). Robyns, Fl. Agrost. Congo Belge 2: 163 (1934). Stapf in Flora of Tropical Africa 9: 651 (1920). Thunb., Prodr. Pl. Cap. : 19 (1794).